You don’t have to be a quilter for very long to start accruing scraps of fabric. A little snip here, a slice there, and pretty soon a pile forms...and grows...and grows. My scraps can be as small as a 2” x 2” print that I’ve grown particularly fond of and can’t seem to throw away. Sigh...yes. That bin. Somehow that bin even survived The Great Purge of 2015 inspired by Marie Kondo’s magical book on tidying up (if you haven’t read it, it’s pretty great. However, don’t expect me to apply it to my fabric stash. That’s asking waaaaay too much.). Let’s get real. We’re not going to throw those scraps away, so let’s do the thing we told ourselves we were going to do when we bought that giant tub. Let’s use those scraps! If you’re like me, and gravitate toward more modern, minimal quilt designs, the idea of a scrap quilt may sound pretty unappealing. I know. I get it. I think there are a couple tricks, however, to help one steer clear of a cluttered composition and keep a clearly focused design. Maintain a precise color palette. Pick a few colors, and stick with them. Even if you use 20 different hues* of blue, the overall appearance will look intentional and well thought-out. Mix yardage into the design. 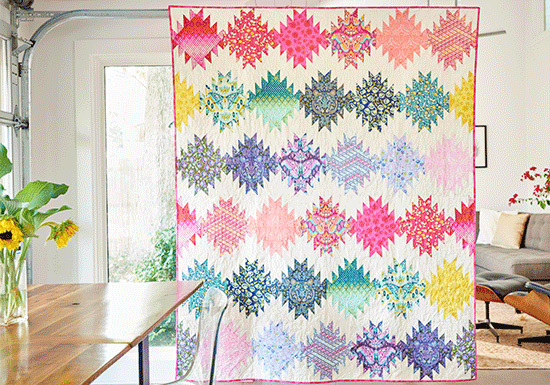 By adding larger swatches of fabric, notably solids, the quilt will seem less busy in its overall appearance and allow the scraps to pop, rather than fade into a sea of pieced prints. *Hue is simply another word for color. A shade is created by adding black to a hue. ie Blue may be a hue, but dark cobalt is a shade. Make sense? 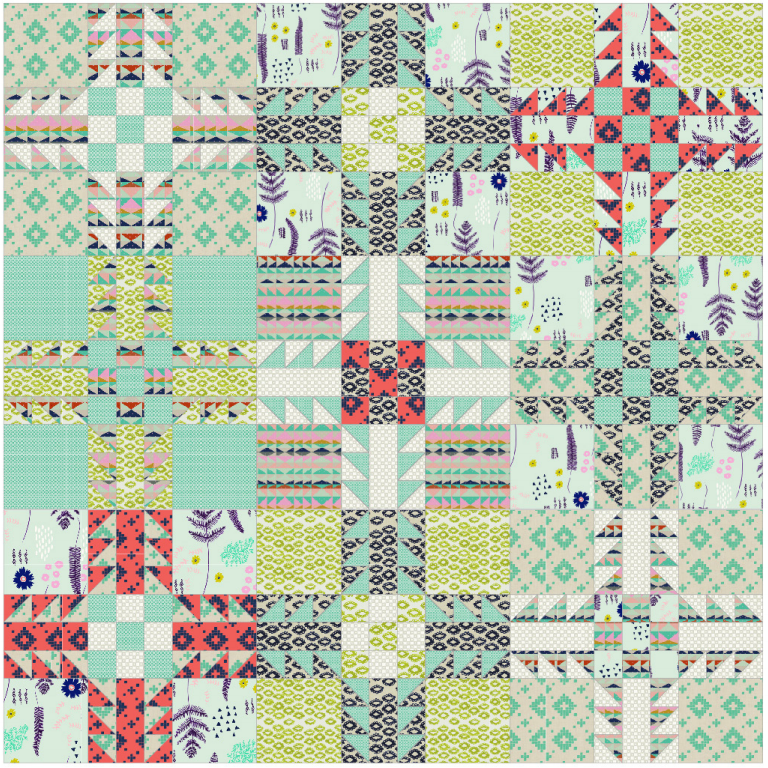 Below are 10 super cute FREE quilt patterns. None of them are specifically written for scrap quilts, but all of them can easily be adapted to accommodate the ever-growing scrap pile. Before diving into a pattern, take a quick assessment of the size of your scraps to make sure the pattern is a good fit. Some of these designs call for larger scraps than others. You could achieve this same look by using any gradation of colorful scraps. When picking scraps for this quilt, lay sections of them out side by side to see how they appear together. Sometimes a dark large print can appear lighter than a chintzy print of a different shade simply because of the scale of the pattern. 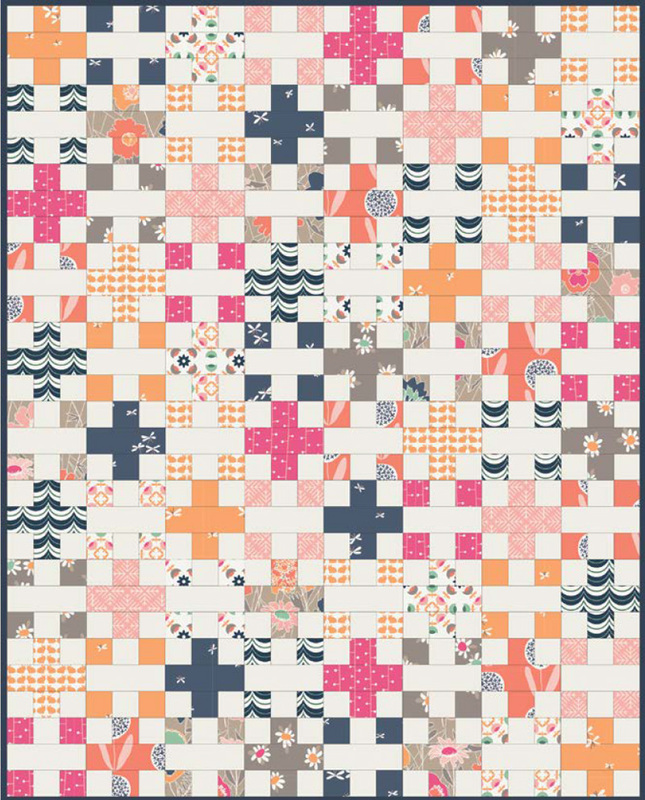 ​This quilt, originally designed for Cotton + Steel Fabric's Picnic line would be perfect for some of your larger scraps of fabric. However, if most of your scraps are 5" or smaller, consider shrinking the size of the triangle templates. If you make all of the templates proportionally smaller, the same pattern will work, but with more success for you and your scraps! ​Simple triangles! What could be better? 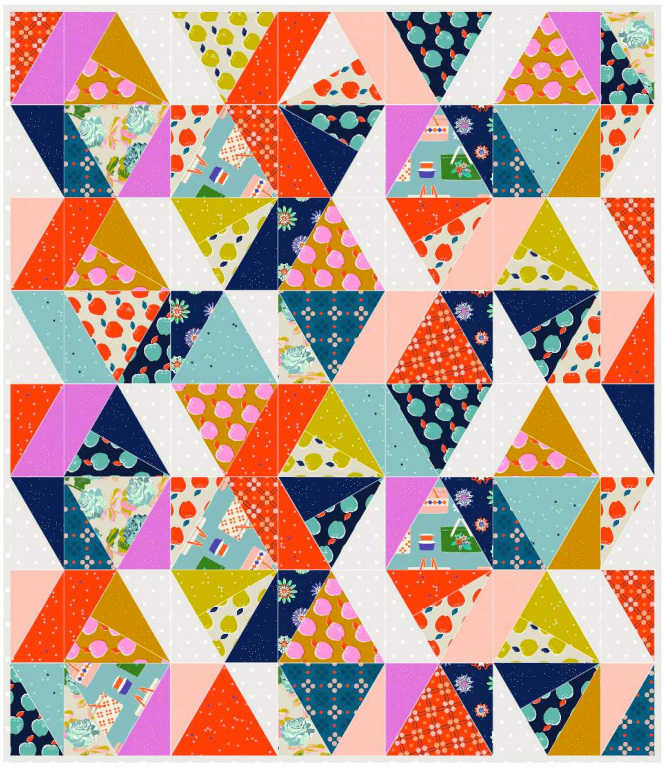 Use the pattern's triangle sewing and cutting technique to create triangles appropriate for your scraps. These triangles can be easily sized up or down as long as you keep them the same as each other. Make fabric. By that, I mean sew smaller pieces of fabric together and then trim them down to the size you need. Introduce some yardage cut to the appropriate size. 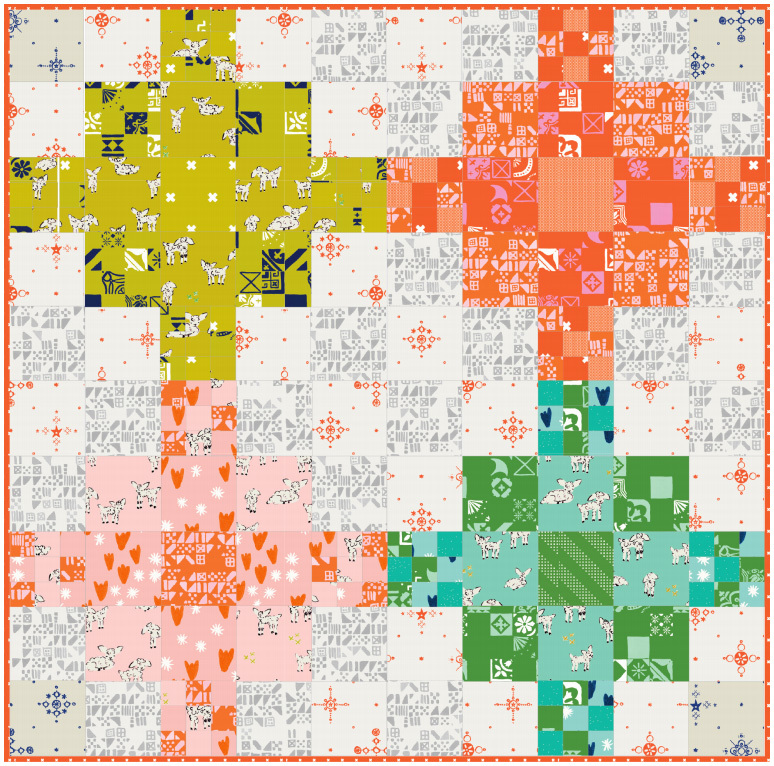 Use your scraps as 3″ squares rather than cutting down 3″ x 6″ strips as the pattern says. The yardage will be used for the 3″ x 6″ strip for the center “cross-bar” of the cross. You see all that yellow? Use scraps! 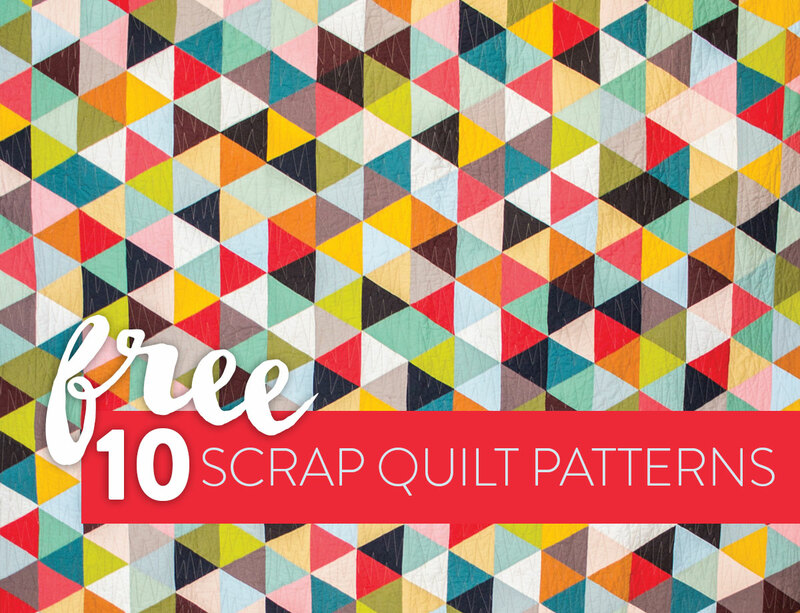 This quilt will look vastly different based on the scraps you have on hand. Although this pattern assumes you are working with yardage and instructs that you cut 2 ½" x WOF (width of fabric) – substitute 2 ½" squares of scrap fabric and sew them together individually. 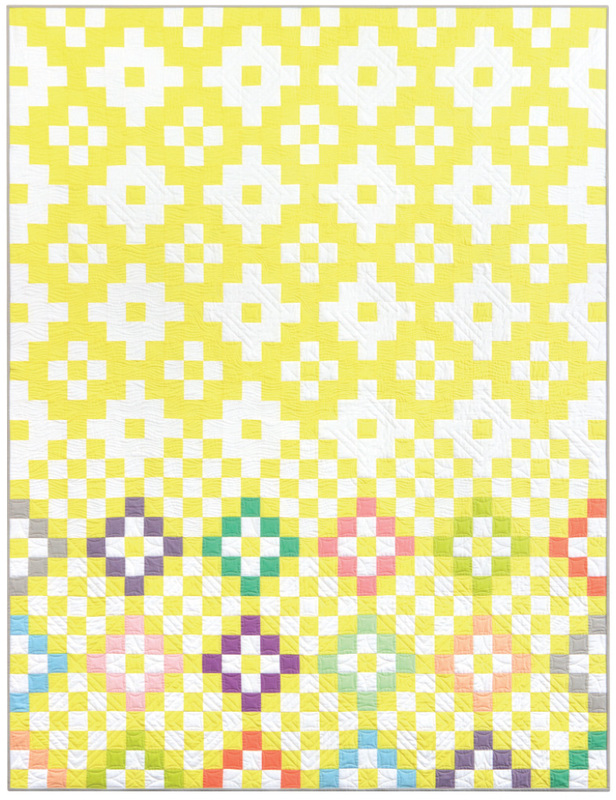 ​When I look at this quilt pattern I see a design primed for solid yardage and tiny scraps. This pattern calls for 2 ½" to 2 ⅞" squares. 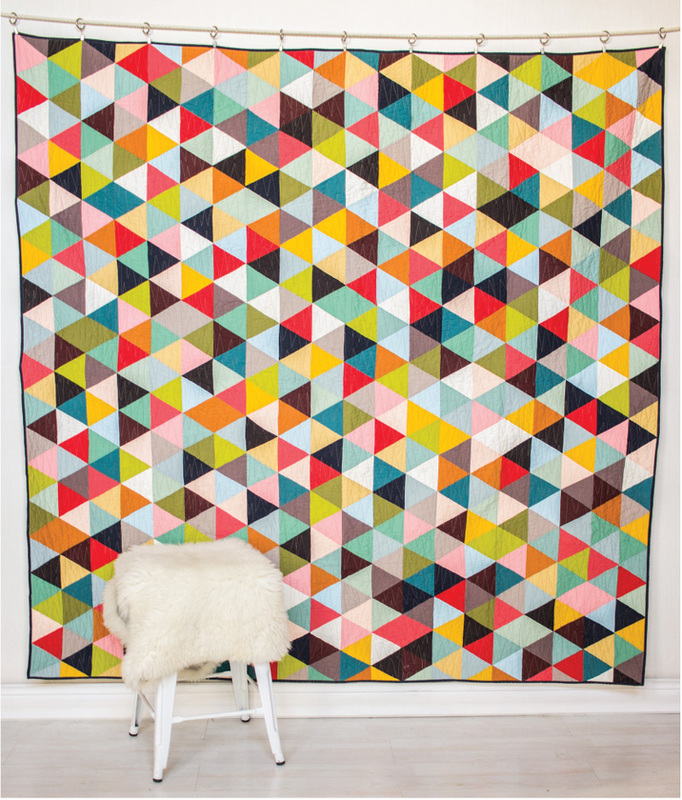 Add a simple pattern and/or solid yardage to that and this quilt will be goooorgeous! 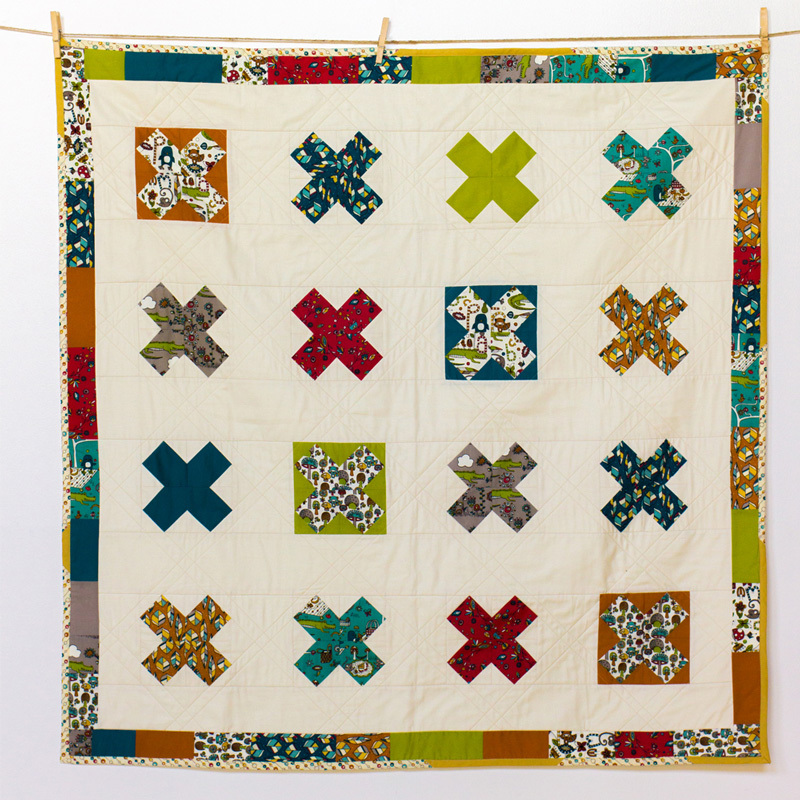 ​The scrappy alterations to this quilt are similar to the #5 Field Day Quilt. Rather than cutting long strips of fabric, use your scraps and cut the exact amount needed for each block. Aside from the cream background these blocks are made up of 2" and 3 ½" squares. For the scrappy border, get crazy! Just use whatever size you have handy! ​If you don't have 8 ½” scraps, you may have to buy a Layer Cake (a precut bundle of 10" squares of fabric) or extra yardage. However, if you're like me and sometimes throw barely snipped Fat Quarters (a precut piece of fabric cut into a wide quarter yard measuring 18" x 21") into the scrap bin, you may have found the perfect solution! 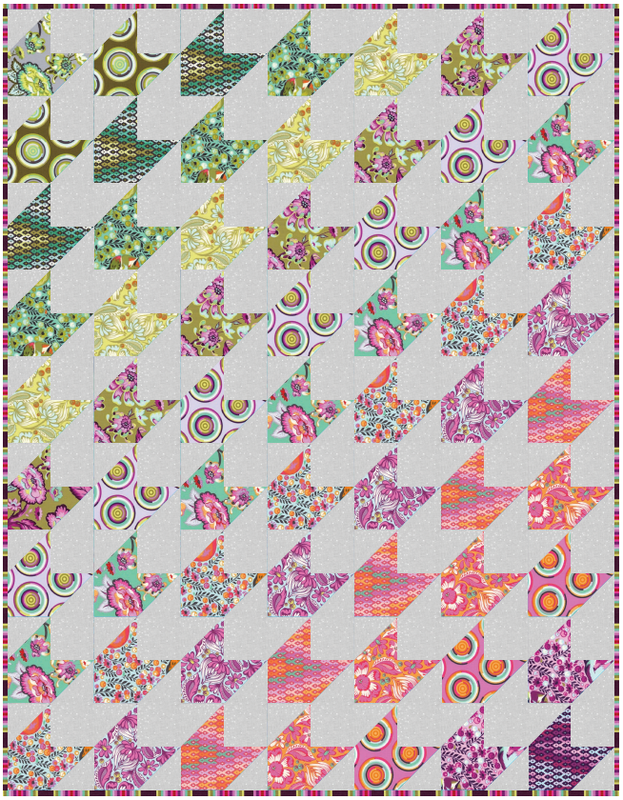 This pattern uses Charm Packs (a bundle of precut 5" squares of fabric). However, if you want to use up some smaller scraps, check out my half square triangle tutorial for different techniques and sizes. The history of patchwork quilting is rooted in economy. As you sift through your scraps, choosing which ones to use, let your mind drift for a moment to an earlier time when quilters did this very same thing. By making a scrap quilt you are joining hands with the quiltmakers of history and sharing in a wonderfully beautiful heritage. I hope you feel strength in that and let the rich tradition of scrap quilting empower you to make something to be proud of! Thank you so much for sharing my quilt! but it’s not actually a free pattern ???? its for sale in my shop. So glad you shared the Clover tutorial, I had been looking for it since Quilt Market. Thanks for sharing these! I saved quite a few to use later. My scrap bins never seem to empty fast enough! 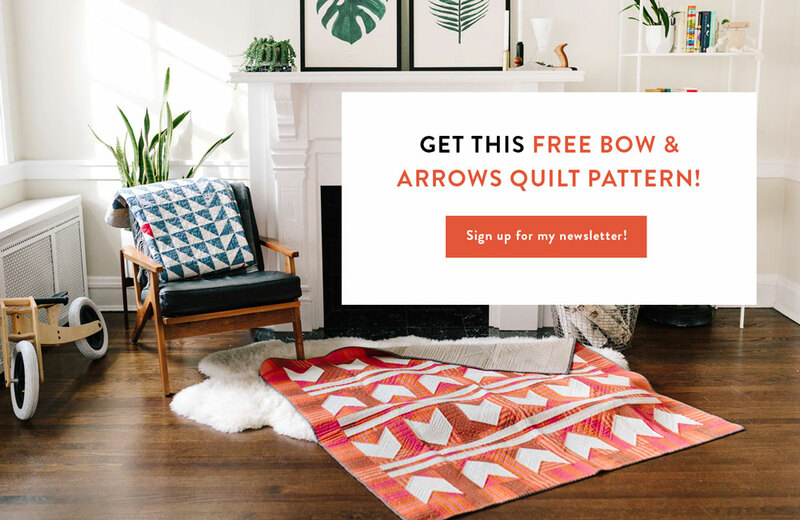 Thanks for sharing the free patterns , I will be sure to highlight your page in my blog site @ http://www.lookyoucan.com We are hosting a rag quilt giveaway when we reach 100 entries . The quilt is made from the Comelot Stitched Gardens Dream alittle dream. Great quilts and great selection. What’s the name of the pattern?